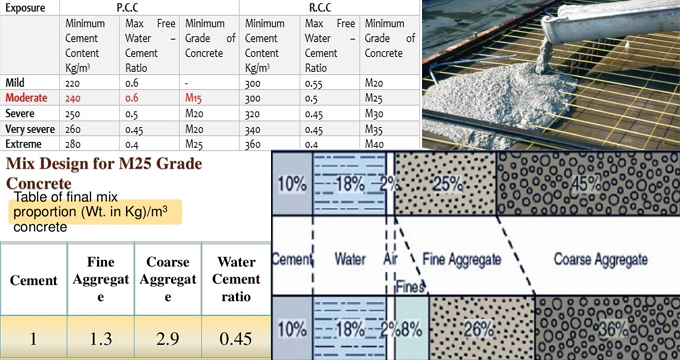 This construction is recorded on a construction jobsite and it shows how to produce mix proportion of m25 grade of concrete in the ratio of 1:1:2 (cement:fine aggregates:coarse aggregates). Here, M denotes Mix and 25 denotes the characteristic compressive strength of concrete cube concerning 150mm X150mm X150mm to be verified at the end of 28 days and it should be minimum 25N/mm2. The proportioning of concrete is described as the method of applicable proportions of cement, sand, coarse aggregate and water, in order to acquire a concrete of preferred quality. Concrete mix design is essential to obtain target strength in structures. The compressive strength of hardened concrete that is usually taken like an index of its other properties, is based on several factors, e.g. quality and quantity of cement, water and aggregates; batching and mixing; placing, compaction and curing.